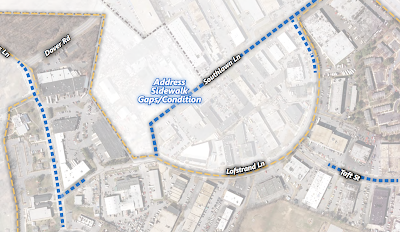 The future of the David Scull Courts, a 105-unit public housing complex operated by Rockville Housing Enterprises, generated the most detailed discussion at last night's Mayor and Council meeting as a consultant presented final recommendations for the Southlawn Industrial Area Study. If you read my previous article, the recommendations in the final report will sound pretty familiar. Consultant Paul Moyer of VHB discussed the findings of the months-long study, which gathered input from residents of neighborhoods abutting the industrial area, industrial business owners, and industrial landowners. Combined with analysis by VHB, BAE Urban Economics, and Schnabel Engineering Consultants, the report makes short and long term suggestions for how the City might better improve the industrial area and integrate it better with the nearby residential homes. 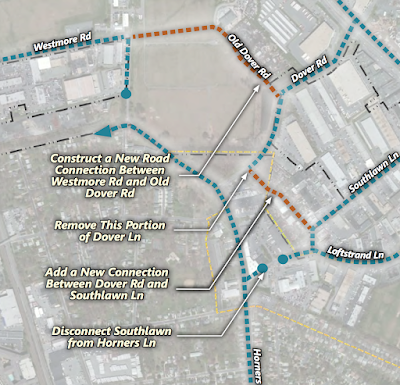 Adding new sidewalks (or replacing damaged ones that already exist), placing new restrictions on cut-through traffic on N. Horners Lane, creating a business organization to advocate for the industrial area, improving pedestrian safety, making changes in parking policies (such as disallowing truck parking on 1st Street at David Scull Courts), and facilitating new businesses like gyms or breweries were among the relatively affordable and timely changes proposed. 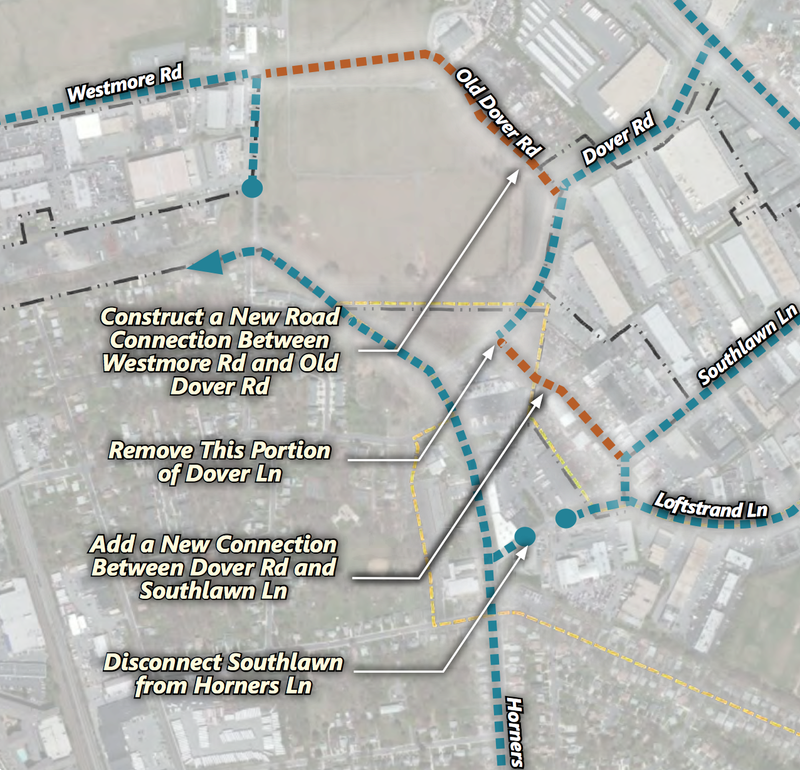 More challenging and expensive long-term suggestions included cutting off road access between the industrial area and residential streets by disconnecting Dover Road and Southlawn Lane from Horners, allowing some new residential development with a buffer zone to the industrial uses, and rezoning David Scull Courts from industrial to residential. That last suggestion was among the most-discussed at last night's meeting. During the Community Forum earlier in the meeting, Melissa McKenna, Vice-President of Advocacy for Maryvale Elementary School's PTA, asked the Mayor and Council to rezone David Scull Courts as residential. Attorney Bob Harris, representing several industrial properties within Southlawn, argued it should remain industrial. Mayor Bridget Donnell Newton asked everyone to consider an ambitious third option - moving the existing residents of David Scull to a future, new development at an unspecified site closer to the town center. This would give them better access to transit and to the retail, restaurants and events of town center, while opening up the David Scull site for redevelopment. David Scull Courts is currently fully-leased, according to apartment search websites. Other topics included the aforementioned parking at David Scull Courts. Councilmember Virginia Onley noted that the current truck parking can make the street intimidating for people walking alone at night. She urged the City to discuss making a parking policy change there as soon as feasible. Councilmember Beryl Feinberg asked if lighting there could be improved as well, noting that such improvements can help increase both safety, and the perception of safety. Councilmember Julie Palakovich Carr asked what type of housing would be appropriate for this area. Moyer said his firm mainly considered townhomes and garden apartments as the best fit for the low-density neighborhood. Her colleague Mark Pierzchala recalled that when he walked every street in the City, he was struck by the idea that Rockville should annex additional land in the Southlawn area to get better control of its future. He noted that basic fixes like cleaning up litter and repairing broken pavement with weeds growing out of it could by themselves make the area more inviting.